← Review – The Skin Collector by Jeffery Deaver. I love friends to lovers stories. I really do. I love the fact they they are so close but it’s always one that never realizes how close they really are. 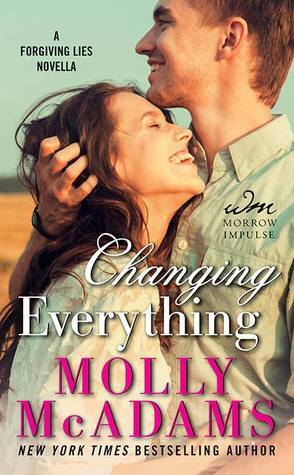 This novella was a quick little read and still packed the punch, the way you expect from a Molly McAdams story. Was there emotion? Yep. Was there excitement? Yep.. Was there sauce? Holy bananas, YES!!! In fact, there was a couple scenes that made me blush. And I’m not one for blushing. Perfection. Paisley has been waiting 12 years for Eli to notice her for more than just a friend, but she’s tired of it and ready to lay her cards on the table and see what happens. But when his reaction is not what she wants, she is forced to try and move on without her best friend. Seeing Eli suffer with the knowledge that he did in fact love his best friend, but pushed her away, was a bit hard on the heart. You know he loves her, but he never knew how much, til the thought of never having her again, drives him to do whatever it takes in order to show her that he does in fact love her the way she deserves to beloved. It was nice to see a glimpse of Rachel and Kash, even if it wasn’t under the best of situations. Tha was needed in order to mentally slap some sense into Eli and make him realize that what he’s been searching for was right under his nose the whole time.